If you read this post last week then you know all about this new series I am beginning here and on my Instagram. I’m even being all relevant and trendy and made a hashtag for it! #hiswordeveryday. It’s my heart’s desire to encourage more people to know God better through studying His word. Then by knowing Him better, loving Him more! I know it can seem intimidating, and knowing where to begin is hard. I am praying that I can come alongside many of you, and we can grow in our knowledge of the Bible and ultimately our knowledge of Christ together. But why is studying the Bible so important? Isn’t it enough to just believe in God, go to church, have morals, and simply be a good person? Why do I need to read this ancient book for myself when I can just listen to my pastor talk about it on Sundays? It’s a really big book full of confusing language and sometimes it just makes no sense, so I’d rather not use my precious time attempting to read it. I know that many Christians feel this way or have had similar thoughts. I was once that person. Maybe you haven’t ever heard anyone explain why reading God’s word for yourself is so important. Anytime we learn about God from other people, be it pastors, speakers, authors, or even a blogger like me, we are hearing from a human. A flawed, sinful person. Does that mean that they have nothing good or true to say? Or that God cannot speak through us lowly humans? Nope. God has ordained so many people to do His work here on Earth. However, we as Believers need to also be studying the Bible for ourselves, so that we know what it holds and are able to spot lies. We must be able to use discernment, and to have discernment you have to know God’s word! I am no expert. I am learning right alongside you! This journey of reading the Bible and really digging in and studying it deeply is new to me as well. So I wanted to give you some encouragement from some people in the faith that are much more mature in their knowledge of God’s word. I reached out to some people in my life and asked them to give a short and sweet answer to the question, “Why is reading the Bible important?” I am blown away and inspired by the answers I received. I pray these bring you some encouragement! The fact is, God’s Word is living and active and was meant for us as Christ Followers to refer to, use, learn from, and ultimately live by. There is not a single perfect human on this Earth, so even the best writers, pastors, podcast creators, and speakers are going to get some things wrong. But God and His word are perfect, and knowing what He has to say will help point our lives towards Him. Is there any greater outcome? Tavia, is there a way I can share this post on my facebook wall? 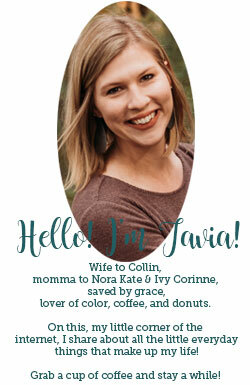 Great start to your blog, Tavia! I pray it encourages many to dig into God’s Word and draw near to him!